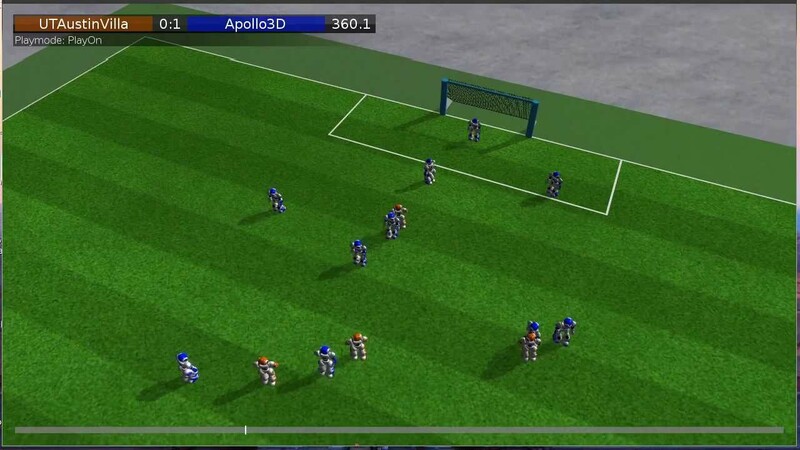 In the 2D Simulation League, two teams of 11 simulated autonomous software programs (called agents) play soccer in a two-dimensional virtual soccer stadium represented by a central server, called SoccerServer. This server knows everything about the game, i.e. the current position of all players and the ball, the physics and so on. Each player receives relative and noisy input of his virtual sensors (visual, acoustic and physical) and is able to perform some basic commands (like dashing, turning or kicking) in order to influence its environment. CHALLENGE: The current challenge in the Simulation Leagues is to determine the best possible action to execute in this complex scenario. As a game is divided into 6000 cycles, this task has to be accomplished in a time slot of only 100 milliseconds. CHALLENGE: The current challenge is the design and implementation of multi-agent higher-level behaviours based on solid low level behaviour architectures, for realistic humanoid robot teams.